Ingredients: (per serving) Calcium (as calcium carbonate) - 100mg, Magnesium (as magnesium hydroxide, magnesium carbonate) - 120mg, Manganese (as manganese gluconate) - 2mg, Chromium (as chromium aspartate) - 20mcg, Potassium (as potassium bicarbonate, potassium carbonate) - 408mg, Stevia (leaf extract) - 10mg. Suggested Use: Pour a packet into 1 liter of water and turn it into electrolyte enhanced water with just a hint of natural lemon-lime flavor. 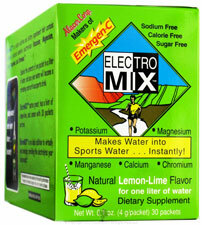 Why use Electrolytes and Supportive Nutrients? Melatonin is a hormone made by the pineal gland in the brain, and is considered a hormone of darkness (produced in the absence of light) that is linked to sleep and wake cycles. When your surrounding is dark, your body produces more melatonin; when your surrounding is bright, your body produces less melatonin. As we age, melatonin production also decreases.